In our three part “Behind-the-Seams” blog series, we last left off with a muslin, the result of pattern making and the equivalent of a “first draft” of a dress. The next step in the process is to use the muslin to assure fit. Just as in user testing, something can be designed and created beautifully but it must “fit” with the user. 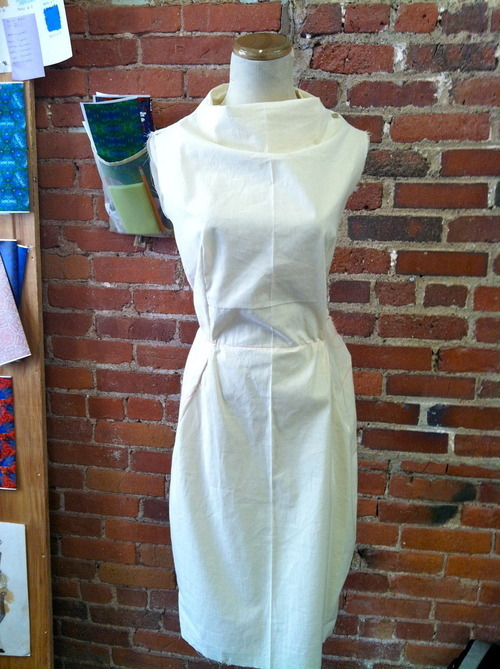 A muslin (the unfinished cotton prototype) is tried on by a fit model (someone with standard body proportions). While on the model, adjustments are marked on the muslin and then translated back to the pattern. The pattern is then cut out in the real fabric and a sample garment is produced. The garment is then once again tried on by a fit model (muslin and real fabrics vary in weight and other fabric properties so samples must be tested as well).